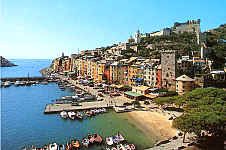 Old landing place since Roman Times, Portovenere is situated on the cape opposite Lerici in the Gulf of Poets. 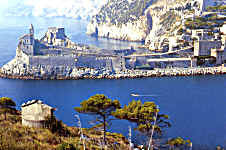 Going north along the coast, you reach the Cinque Terre. This small fishing village is today a tourists' and sea lovers' destination and is famous for its restaurants where fresh fish and shellfish are always available. Its tall, narrow brightly coloured houses are typical of the region. The old Saint Peter Church (1277) is situated on the end of the cape and overlooks the Byron Grotto. 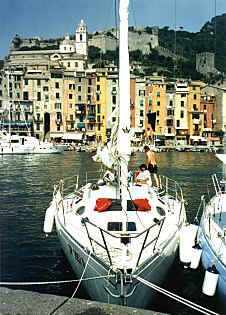 Higher up stands the Mediaeval Castle, built in 1161 by the Genoese. In the centre stands the Saint Laurence Church (1116) in the Longobard Style. Along the streets, shops and stands sell local products and souvenirs.